Apoptosis is a physiological cell death process important for development, homeostasis and the immune defence of multicellular animals. The key effectors of apoptosis are caspases, cysteine proteases that cleave after aspartate residues. The inhibitor of apoptosis (IAP) family of proteins prevent cell death by binding to and inhibiting active caspases and are negatively regulated by IAP-binding proteins, such as the mammalian protein DIABLO/Smac. IAPs are characterized by the presence of one to three domains known as baculoviral IAP repeat (BIR) domains and many also have a RING-finger domain at their carboxyl terminus. More recently, a second group of BIR-domain-containing proteins (BIRPs) have been identified that includes the mammalian proteins Bruce and Survivin as well as BIR-containing proteins in yeasts and Caenorhabditis elegans. These Survivin-like BIRPs regulate cytokinesis and mitotic spindle formation. In this review, we describe the IAPs and other BIRPs, their evolutionary relationships and their subcellular and tissue localizations. The inhibitor of apoptosis proteins (lAPs) were originally identified in baculoviruses, where they provide a mechanism for enhancing viral propagation through inhibition of defensive apoptosis by host insect cells [1,2]. Cellular IAPs were subsequently described in insects and vertebrates [3,4,5,6,7,8,9]. In recent times, it has become apparent that there is a second group of BIR-domain-containing proteins (BIRPs) carried by organisms such as Caenorhabditis elegans and yeasts as well as mammals and insects that can be distinguished from IAPs both by function and by structural features of their BIR domains (reviewed by Miller ). The domain structures of various BIRPs is shown in Figure 1a, and the relationship of different BIR domains to each other is illustrated by the phylogenetic tree in Figure 1b and an alignment of a selection of BIR domains is given in Figure 1c. Table 1 lists the chromosomal localizations of the genes encoding human BIRPs as well as their tissue expression patterns and the disease situations in which alterations of the genes have been observed. Structure and evolution of BIRPs. (a) Domain structures of BIRPs in mammals (humans), insects, nematodes and yeast. The length of each protein (in amino acids) is shown on the right. IAPs have type 1 BIR domains (dark blue), whereas type 2 BIR domains (light blue) are found in Survivin-like BIRPs. (b) The evolutionary relationship of BIR domains. A phylogenetic tree was generated using the parsimony option of the PHYLIP Phylogeny Inference Package (version 3.5c) , from BIR domains aligned by the Clustal W1.7 program. The accession numbers and regions used in the analysis are shown in Table 2. Default settings were used; the order of the sequences was jumbled 10 times and the degree of certainty for each node (the bootstrap value, shown on the Figure) was calculated from 100 random replicates. All bootstrap values greater than 50 and selected others are shown. The values for placement of ML-IAP with NAIP BIR3 and BIR2 domains are very low, and trees calculated using distance methods placed ML-IAP BIR with the BIR3 domains of XIAP, cIAP-1 and cIAP-2. Also, note that the alignment used to generate this tree does not include the carboxy-terminal α-helical extension that is conserved between the BIR3 domains of XIAP, cIAP-1, cIAP-2 and ML-IAP but not NAIP. (c) Two types of BIR domain. An alignment of a selection of BIR domains illustrates the difference between BIR domains present within classical IAPs (top four sequences) and within other BIRPs (bottom four). Aligned regions are as given in Table 2. Amino acids that are conserved in all BIR domains are highlighted. Type 1 BIR domains are approximately 70 amino acids long, whereas type 2 BIR domains are longer. The first group of BIRPs encompasses those that inhibit cell death; they are appropriately called IAPs. These proteins have between one and three BIR domains and also often have a RING-finger domain. IAPs have been identified in several multicellular organisms from Drosophila to mammals, but are not present in plants, yeasts, protozoans or C. elegans. The close relationship between baculoviral IAPs and insect IAPs suggests that baculoviral IAPs may have been acquired through gene transfer from host insect cells . The BIR domains of IAPs can be grouped into several subtypes (Figure 1b). The three BIR domains - BIR1, BIR2 and BIR3 - of human XIAP, cIAP-1 and cIAP-2 fall into three different subgroups, suggesting gene duplication of an ancestral IAP gene encoding three BIR domains and a RING finger. The gene encoding murine XIAP/MIHA/hILP/BIRC4 spans approximately 20 kilobases (kb) and the protein is encoded by six exons . The initiation codon, the BIR1 and BIR2 domains and half of the BIR3 domain is encoded by exon 1. The rest of the BIR3 domain is encoded by exons 2 and 3; exons 4 and 5 encode the following non-structural region and exon 6 encodes the carboxy-terminal RING-finger domain and stop codon. The structures of the genes for cIAP-1/MIHB/hiap2/BIRC2 and cIAP-2/MIHC/hiap1/BIRC3 are reportedly similar to that of XIAP (referred to as unpublished data by Farahani et al. ). Mammalian cIAP-1 and cIAP-2 are very similar to each other and their genes are tightly linked (about 12 kb apart), suggesting a relatively recent gene-duplication event . Both proteins have three BIR domains, a caspase recruitment domain (CARD) and a RING finger. The recently identified IAP ML-IAP/LIVIN/KIAP/BIRC7 has only one BIR domain which is most highly related to the BIR3 domains of cIAP-1, cIAP-2 and XIAP, particularly in having an α-helical extension carboxy-terminal to the BIR domain [14,15,16]. There are thought to be six tightly linked NAIP genes in mice and humans [17,18,19]. The BIR domains of NAIPs are more distantly related to the BIR domains of the other mammalian IAPs (see Figure 1b) and NAIPs do not have a RING-finger domain but do have a nucleotide-binding domain at their carboxyl terminus [5,20]. There are two Drosophila IAPs, DIAP1 and DIAP2, which have two or three BIR domains, respectively and which each have a carboxy-terminal RING-finger domain . Another insect IAP, SflAP from Spodoptera frugiperda, has also recently been described, with two BIR domains and a carboxy-terminal RING-finger domain . There are several baculoviral IAPs; most have two BIR domains and a carboxy-terminal RING-finger domain [1,2]. The second group of BIRPs includes mammalian Survivin/BIRC5 and Bruce/BIRC6, C. elegans BIR-1 and BIR-2 (shown as CeBIR-1 and CeBIR-2 in Figure 1), yeast Spbir1P and ScBIR1P and Drosophila proteins d-Bruce and Deterin [21,22,23,24,25]. Apart from their BIR domains, these proteins are otherwise highly variable in size and structure. They have slightly larger BIR domains than those of the IAPs (see Figure 1c) and there is a conserved intron after the invariant glycine-encoding codon in the BIR-domain-encoding region that is not present in IAP genes. The presence of the Survivin-like BIRPs in a wide range of organisms and their conserved function suggests that they represent the earliest BIRPs. It is possible that, following a gene-duplication event, the BIR domains in IAPs evolved to have a different function, namely to interact with and inhibit caspases. The genes for both murine and human Survivin have been described, and both comprise four exons, with exons 2 and 3 encoding the BIR domain [26,27,28]. BIR domains are characterized by a number of invariant amino acids, including three conserved cysteines and one conserved histidine residue within the sequence CX2CX16HX6-8C (Figure 1c). Within IAPs, BIR domains are typically about 70 amino acids long, but they can be more than 100 amino acids long in other BIRPs. The structures of the cIAP-1 BIR3 domain and the XIAP BIR2 and BIR3 domains are very similar, indicating that BIR domains typically comprise a series of four or five α helices and a three-stranded β sheet with a single zinc ion coordinated by the conserved cysteine and histidine residues [29,30,31,32,33]. RING fingers, a type of zinc finger, are present in diverse proteins. A carboxy-terminal RING finger domain is present in most of the IAPs and has, for XIAP and c-IAP-1, been shown to have ubiquitin protein ligase activity, directly regulating self-ubiquitination and degradation . RING domains are characterized by the presence of a set of invariant metal-binding residues (C3HC4) that coordinate two zinc ions . The equine herpes virus protein RING has been shown to consist of an amphipathic α helix next to a triple-stranded β sheet . The c-IAP1 and c-IAP2 proteins have caspase recruitment domains (CARDs) between their three BIR domains and the RING-finger domain. The name relates to the ability of CARDs within adaptor proteins such as Apaf-1 to interact with CARDs within some initiator caspases (see later), such as caspase 9 . The CARD fold is related to other protein-protein interaction domains found in proteins involved in cell death and elsewhere, such as the death domain, the death effector domain and the pyrin domain. The only IAPs described to date that possess a CARD are cIAP-1 and cIAP-2, and the function of this domain in these proteins is not known. Protein-protein interactions of cIAP-1 or cIAP-2 CARDs with CARDs of other proteins have not been described, nor have the CARDs been shown to self-associate. The structure of cIAP-1 and cIAP-2 CARDs have not yet been described, although CARDs from other proteins have been shown to comprise six or seven tightly packed anti-parallel α helices, with both charged regions and hydrophobic regions mediating CARD-CARD interactions [38,39,40,41,42]. The tissue and subcellular localization of mammalian IAPs varies (see Table 1) and may be important in determining the relative contribution of different IAPs to cell-death regulation in different cell types and in response to different apoptotic stimuli. XIAP appears to be widely expressed [5,6]. It has a cytoplasmic location and has been reported to inhibit cell death in response to a variety of apoptotic stimuli including ultraviolet irradiation, tumor necrosis factor (TNF), Fas ligand, and a number of toxic drugs (reviewed by LaCasse et al. ). XIAP very efficiently interacts with and inhibits active caspases 3, 7 and 9 [44,45,46]. Interaction of XIAP via its RING-finger domain with bone morphogenetic protein (BMP) type I receptors has also been reported, which would presumably enable some XIAP to localize to the plasma membrane . A role for XIAP in regulating the BMP receptor signaling pathway by linking the receptor to downstream signaling molecule TAB1 has been proposed. The cIAP-1 and cIAP-2 proteins were initially identified in a complex with TNF receptor 2, an indirect association resulting from direct interaction with TNF-receptor-associated factors (TRAFs) 1 and 2 involving the BIR and TRAF domains of the respective proteins . The expression of cIAP-1 and cIAP-2 is increased following activation of the NF-κB transcription factor by the TNF receptor, and these IAPs may have a role in protecting cells from TNF-induced apoptosis by reducing the amount of caspase 8 activation . Exactly how they do this is unclear, because caspase 8 can not be directly inhibited by cIAP-1 or -2 or by any other known IAPs . Perhaps they act by inhibiting downstream caspases such as caspase 3, preventing the feedback loop involved in the further activation of upstream caspase 8. The cIAP-1 and cIAP-2 proteins have been shown directly to inhibit the activity of caspases 3 and 7 . Although cIAP-1 and cIAP-2 can be found within the TNF-R complex, and they are presumably localized in part to the cell membrane, it is not clear what proportion of total cellular cIAP-1 or cIAP-2 this represents, and when transiently transfected into cells, cIAP-1 has a perinuclear localization . The recently described mammalian IAP ML-IAP is detectable in embryonic tissue, selected adult tissues and several cancer cell lines, particularly in melanoma cell lines (see Table 1) [14,15,16]. One study reported expression predominantly in the nucleus but also in filamentous structures in the cytoplasm, whereas only cytoplasmic expression was reported in another study. Although ML-IAP has only one BIR domain, it is reported to interact with and inhibit both the initiator caspase 9 and effector caspases 3 and 7; it inhibits cell death induced through death receptors, by overexpression of the cell-death pathway proteins FADD, Bax, RIP, RIP3 and DR3 or in response to various toxic drugs. The first NAIP gene was identified as a candidate gene defective in spinal muscular atrophy [5,20]. It is now clear that deletion of a neighboring gene encoding the protein survival motor neuron (SMN) is the cause of the disease , but it is possible that loss of functional NAIP may contribute to the severity of the disease. NAIP is reported to inhibit cell death in response to serum withdrawal, menadione and TNF, but because the NAIP cDNA used in these experiments does not correspond to any of the NAIP genes and may represent sequences derived from a number of different NAIP genes, the exact activities of NAIP proteins are unclear. The strongest evidence for regulation of developmental cell death by IAPs comes from studies in Drosophila, where loss of DIAP1 results in extensive early embryonic cell death and a corresponding increase in caspase activity . An equivalent study in mammals is still required to establish the role of these proteins in mammalian developmental cell death (see Frontiers section). A punctate perinuclear pattern of expression has been described for DIAP2 when overexpressed in insect cells . Although originally described as a protein that could inhibit cell death , Survivin functions primarily in the regulation of cell division, a role conserved in the yeast and C. elegans BIRPs, whose BIR domains closely resemble that of Survivin [23,24,54,55,56,57,58,59]. Survivin is expressed only during mitosis (see Table 1). Subcellular localization has shown that Survivin is a chromosome passenger protein: that is, it is initially associated with the centromeres, but at the metaphase-anaphase transition it leaves the centromeres and remains in the spindle midzone [56,57,58,60]. It can be found in the mid-body at telophase, after which it is ubiquitinated and degraded. Consistent with its subcellular localization, elimination of Survivin by homologous recombination results in mouse embryos that are unable to survive beyond day 5 because of failure of cytokinesis . The C. elegans proteins BIR-1 and BIR-2 are also involved in the regulation of cytokinesis [23,57]. BIR-1, like Survivin, is expressed only during cell division and is a chromosome passenger protein. The phenotype of BIR-1-deficient embryos is identical to that of embryos deficient for the Aurora-like kinase AIR-2, and BIR-1 is required for localization of AIR-2. Like Survivin and the C. elegans BIRPs, yeast proteins ScBIR1P and Spbir1P have a role in regulating cell division , and as yeasts do not have caspases, a role in cell-death regulation can be excluded. Mammalian Bruce/Apollon has a punctate pattern of cellular expression and colocalizes with the Golgi marker protein TGN38. Expression in dendrites and axons of primary neurons has also been detected . While Bruce has a BIR domain at its amino terminus, it also has ubiquitin-conjugating activity as a result of a ubiquitin-conjugating enzyme (UBC) domain at the carboxyl terminus of the protein. The BIR domain of Bruce is most similar to the BIR domains of Survivin and other BIRPs that are involved in regulating cell division, although the function of Bruce is unknown. Caspases are produced as inactive zymogens that are processed into an active form following cell-death stimuli. The active caspase is believed to be a heterotetrameric complex generated from two zymogen monomers. Cell-death pathways involve the sequential activation of initiator and effector caspases (see Figure 2). Activation of initiator caspases such as caspases 9 and 8 is facilitated by adaptor proteins such as Apaf-1 or FADD, and when activated, caspases 8 and 9 can process and activate downstream effector caspases such as caspases 3 and 7. IAPs can inhibit some active caspases, whereas the mammalian protein DIABLO antagonizes IAP function [61,62,63] (see Figures 2,3). The role of IAPs in the regulation of cell death. Apoptosis induced by TNF or Fas ligand via death receptors (DR) involves adaptor-protein-mediated recruitment and activation of initiator caspases, such as caspase 8 (C8), and the subsequent activation of downstream caspases such as caspase 3 (C3) and 7 (not shown). 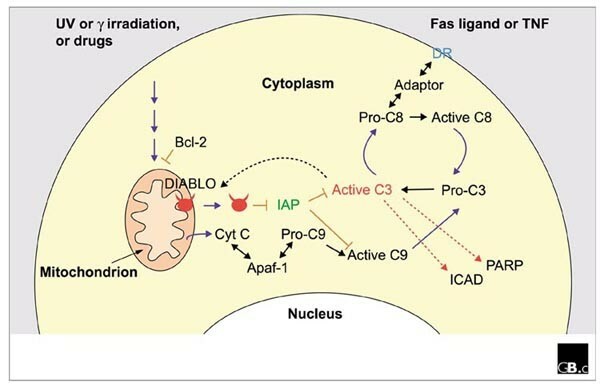 In cell death induced via stress pathways such as irradiation or drugs, cytochrome c (Cyt c) and DIABLO are released from the mitochondria. Cytochrome c binds to the carboxyl terminus of the adaptor protein Apaf-1, allowing it to unfold, interact with inactive caspase 9 (Pro-C9) and promote its oligomerization and autoprocessing to give active C9; active caspase 9 then can activate downstream caspases. Pro-survival members of the Bcl-2 family inhibit cell death via stress pathways and can prevent release of cytochrome c and DIABLO from mitochondria. The downstream caspases cleave cellular substrates (such as poly (ADP-ribose) polymerase (PARP) and inhibitor of caspase-activated DNase (ICAD)), resulting in many morphological changes and culminating in cell death. IAPs prevent cell death by interacting with and inhibiting active caspases, whereas the IAP antagonist DIABLO can prevent these interactions. Mechanism of caspase inhibition by IAPs and its prevention by the IAP antagonist DIABLO/Smac. (a) The amino terminus of the p10 subunit of caspase 9, revealed following autoprocessing, interacts tightly within a groove of the BIR3 domain of XIAP. (b) The linker region upstream of the BIR2 domain of XIAP interacts tightly with the catalytic site of caspase 3 (and caspase 7; C indicates the catalytic cysteine residue), resulting in effective caspase inhibition. A less significant interaction of the amino terminus of the small subunit of caspase 3 within a groove of the BIR2 domain has been proposed. (c) The amino terminus of DIABLO (red) is similar to that of caspase 9 and competes for the exact same interaction site within the BIR3 domain. (d) A similar groove within the BIR2 domain of XIAP is believed to mediate interaction with DIABLO and provides a mechanism for DIABLO to remove caspase 3 from XIAP. The BIR3 domain of XIAP interacts with and inhibits active processed caspase 9 [46,63,64]. 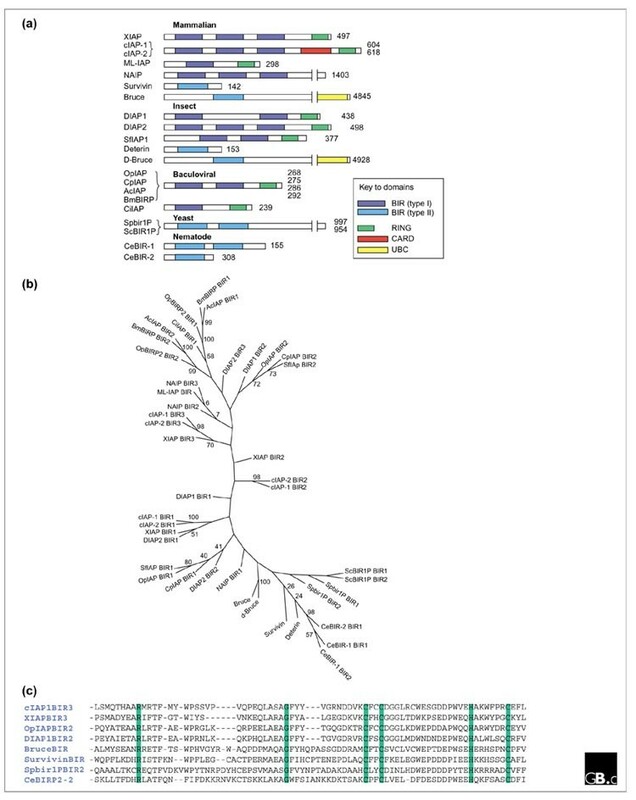 The amino terminus of DIABLO and that of the p10 subunit of active caspase 9 - which is revealed only after autoprocessing - are similar and compete for exactly the same site within a groove of the BIR3 domain of XIAP [64,65,66,67,68,69] (Figure 3). The interactions of DIABLO and caspase 9 with XIAP are thus mutually exclusive. The amino termini of the Drosophila proteins Grim, Reaper and Hid are similar to the amino terminus of DIABLO within the first four amino acids, and this region is responsible for interaction with IAPs [67,68,69]. The main point of contact between caspases 3 and 7 and XIAP involves the linker region immediately upstream of the BIR2 domain of XIAP [31,32,33,70] (Figure 3). The linker forms a direct contact with the catalytic site of the caspases, thereby blocking their activity. An additional interaction of the amino terminus of the processed p10 fragment of caspase 3 within the groove of the BIR2 domain has been proposed  and, although dispensable for caspase interaction and inhibition by XIAP, the IAP antagonist DIABLO/Smac is thought to compete for the same groove, presumably levering out caspase 3 and dislodging it from the IAP. DIABLO is a dimeric protein with two amino termini that can potentially interact with BIR domains . 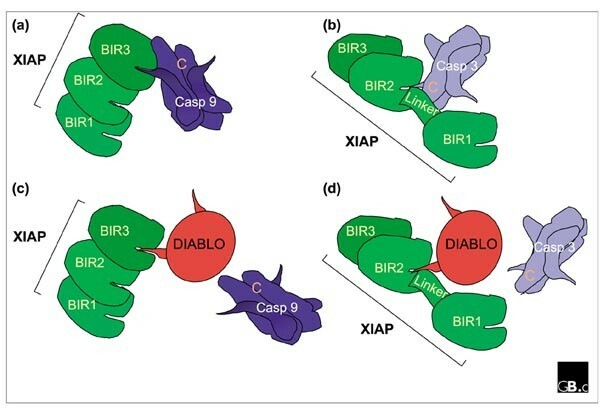 Although DIABLO is able to interact with individual BIR2 and BIR3 domains, albeit with higher affinity for the BIR3, the type of interaction favored with full-length XIAP is not known. For example, it is possible that a DIABLO dimer interacts simultaneously via its two amino termini with both the BIR2 and BIR3 domains on a single XIAP molecule, or that the two amino termini interact with BIR domains on different XIAP molecules with three different possible BIR domain combinations (two BIR2 domains, a BIR2 plus BIR3 domain or two BIR3 domains). Establishing this structurally may be difficult given that the generation of well-folded full-length XIAP has eluded crystallographers so far. Our understanding of IAPs and how they inhibit cell death has taken enormous strides in the last few months. At a structural level, we now know how IAPs interact with and inhibit caspases and how this interaction can be regulated by IAP antagonists such as DIABLO. Much research is still required, however, to define the different roles for different mammalian IAP proteins in the face of different cell-death stimuli. It is likely that there is some redundancy between family members. Indeed, MIHA-deficient mice are without phenotype, with the exception of apparently increased expression levels of cIAP-1 and cIAP-2, suggesting some compensation . It may be necessary to generate mice deficient for more than one IAP in order to establish the role of IAPs in mammals. So far, only one mammalian IAP antagonist, DIABLO, has been described, but given that there are three such proteins in Drosophila, other mammalian IAP antagonists are almost certain to exist. The second group of BIRPs discussed in this review are clearly involved in regulating cytokinesis, although the exact mechanism is not known. Direct interactions of BIR domains from these proteins with other cellular proteins have not yet been reported but are likely to provide some clues to how these proteins function. We would like to acknowledge John Silke for helpful discussions.